AFI (A Fire Inside) is a hybrid of harmony and hate; vocally and lyrically. The band bridges the growl sound with clean retro-skate punk music that kindles the listener's own fire inside. 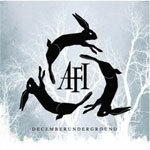 AFI's current release "December Underground" is an emotional call to arms with an ironic title considering their musical career. Originally formed in 1991 AFI released a slew of EP's and singles and then suddenly split up to attend different colleges. Then a reunion show rekindled AFI's spark resulting in the members leaving school to get back to their music. Virtually unknown by the mainstream, AFI is now seeing the fruits of their labor with the current release. It's been a long cold winter of a career and now they are ready to spring forth from the underground. Drawing from their collegiate consciousness the first single "Miss Murder" has a gothic horror vibe that is reminiscent of an Oscar Wilde novel. Is beauty the only thing in life worth pursuing? What debaucheries are required to perpetuate eternal beauty in one's own life? The depravity continues in the catchy, "Love Like Winter." The song is a vampiric tale of love as it continues the theme of the frosty moments contained in this life. It is a hopelessly romantic supplication to have love returned; always and forever. Surrealistic love continually spirals out of control with the rocking "The Missing Frame." It just seem like these guys have not had good romantic relationships. There are some very impressive guitar and vocal tracks on this song in that it hastens back to early U2. With lyric "please don't' wake me up until someone cares", it's apparent that AFI is working though cathartic amour. With "The Killing Lights" AFI presents its version of going to bed with a "10" at 2 am and waking up with a "2" at 10 am. Anyone who has experienced a one night stand is familiar with the morning complications. "December Underground" is an awakening of feelings in an otherwise cold world. The emotional brooding release is well balanced with harmonic tendencies as well as stentorian roar of Lead singer Davey Havok. After all you can't discern the beauty without getting a little ugly.